I first decided I wanted to be a writer when I was 16, but took me until my mid-thirties to commit to focusing on it wholeheartedly. Some would even say I still have too many other interests to class myself as a full-time dedicated author. Once the decision was made and I started to bring about the changes to my life to make it happen, I consulted the people I already knew were already successful writers. After years of thinking about it, I was finally going to do it: all I needed to do was find a publisher. One of the authors I consulted about finding a publisher gave me some rather surprising advice. He is well into his career and a best-seller: he has sold literally hundreds of millions of copies of his books and he told me in complete sincerity that, if he was starting his career over in this new world of publishing – the electronic world – he would not choose to go with a traditional publisher. Instead, he would keep control of his own material and set up his own publishing imprint. This conversation took place in 2005 and, six years later, his advice has proven to be right on the mark. In fairness, he said that being who he is (and I am not going to mention his name so as not to upset the apple cart), at this point in his career, he would hardly change. He is one of the few authors who can literally demand pretty much anything he wants from his publisher and they will meet his needs without demur, but if he were to do it over again from scratch, he insisted he would go it on his own. This pretty much had the right amount of influence over me, and so I created Black Mary Press. 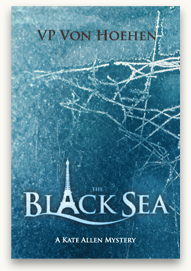 In April of this year, Black Mary Press published The Black Sea, the first in a series of book featuring lead character, Kate Allen. The novel was launched officially at the London Book Fair, where the imprint was also introduced to the publishing world. There are five books planned in the Kate Allen series. All of these will be developed into screenplays with the intention of creating a global franchise for the character in the cinema and/or including network and cable television. The screenplay of The Black Sea is already in development. Black Mary Press does not conform to the traditional narrow view of an imprint. It is a company dedicated to developing creative talent across a wide variety of media to the best benefit of the content creator. The objective of Black Mary Press is to find more creative properties that can be developed over a wide variety of formats in order to extract the greatest benefit for the artist and thereby drive revenues for the company. Black Mary Press, therefore, is more than just a publisher. It is a creative incubator that looks far beyond the limited parameters of traditional publishers. Traditional publishers are desperately trying to hold on to classic paper-based distribution and are failing to adapt to new market demands. They are keeping their authors, like the friend I mentioned earlier, tied mainly to the paper-based distribution. Part of the reason he chooses to stay with his current publisher is that they are willing to pay him very well – perhaps above the market rate – because he is one of the few whose books people will buy on paper and pay the higher price. His publisher intentionally keeps the paper versions of his books close to the price of the electronic price of his books (even though the development and distribution costs of the e-version is next to nothing). The traditional publishers are burdened with costs linked to how they have done business in the past. Realistically, for their survival, they need to write off a lot of their investment as sunk costs and come out fighting in what is the new publishing market; but kings fight to the death to protect their kingdoms, even after their time has passed. Andrew Wylie, a well-known agent, has taken over the electronic publishing of many of his big name clients, including Rushdie and Naipaul. These authors’ publishers simply weren’t doing the job for them, so the agent stepped in to do it. New publishers need to be more flexible and less restricted in their approach to new media markets. They need to exploit all possible avenues of generating revenue for their clients and their clients’ work beyond mere book sales and rights sales. Black Mary Press was founded with a fresh perspective on traditional publishing and we are dedicated to taking this approach, not only with my own creative works, but with those of all of our talent. We are currently looking at great projects from a number of highly talented fiction and non-fiction writers (including some world-class chefs) – but we are certainly not limiting ourselves creatively. Our goal is to bring a select group of authors to a global audience by targeting ideas that can be exploited across several media formats. We believe our authors offer strong, unique talent and we work with them to provide passionate readers from around the world with exceptional quality and engaging content.